HAVANA - Little over a year since the United States and Cuba began restoring diplomatic ties, the Christmas spirit is sweeping through Havana. “Merry Christmas!” declares an inflatable Santa at La Puntilla, a four-story shopping center overlooking the ocean. Stores sell such items as Hang Ten jeans, Long Beach Polo Club shirts and Karlyu Delon dress shoes. Shirts and shorts that cost less than $20 in the U.S. go for $35 and up, equal to about six weeks’ wages for many Cubans. Other items at La Puntilla include BMW Motor Sport Puma driving shoes, $116; Chinese-made Boyang tennis shoes, $32; and “Sweetly Baby” dolls, $29. Cubans able to pay such prices often work for foreign companies based on the island. Or they get remittances from relatives abroad. Or they have coveted jobs in tourism. “Buying Christmas presents is only for those who have money,” said Victoria Lescay, 55, a security guard. She said she earns about $10 per month and gets paid on the 9th. Lescay works at a museum in Old Havana. Rescued street dogs - including two named Canelita and Aparicio - help guard the place. Tourists sometimes tip Lescay, but she said that bearded man from the North Pole hasn’t shown up yet. It’s not as if there’s no money around. Private restaurants and B&Bs are bustling as tourists stream in from the U.S., Canada, France and other nations. Many hotels are filled to capacity and rental cars are scarce. But tourist dollars aren’t trickling down to everyone and workers say there is an increasing gap between the haves and the have-nots. “And not enough to eat well,” a friend interrupted. Cabaza lives with his wife and one child. On a recent afternoon, he was out on the sidewalk in the Vedado neighborhood hawking Internet Wi-Fi cards. ETECSA, the state-run phone company, sells the cards, but buyers must wait in line to get them. Cabaza endures the lines, buys the cards for about $2 each and sells them for a profit on the street. Buyers use the cards to connect to the Internet at Wi-Fi hot spots throughout Havana. “I am feeding my family, but I don’t make enough to get rich,” Cabaza said. Diosdado Roque, a taxi driver, said he’s seen an improvement in the economy. And he expects an even bigger boost once the U.S. begins regular commercial flights to Cuba. U.S. officials announced earlier this month that they reached a deal with Cuba for as many as 120 flights per day. That includes 10 flights each to nine regional airports and 30 flights to Havana. On a recent morning, he and his wife, Yanerys, waited in line to get into a Cuban-style dollar store on the fourth floor of La Puntilla. More than 35 people crowded around the store’s front door. Employees worried they’d lose control of the crowd, so let only 10 or 12 people inside the store at a time. Once the door opened, Roque and his wife walked past a wall of merchandise, cardboard boxes from China stacked at least 10 feet high. Inside the store, the selection of products was modest. There were bottles of shampoo and conditioner, jewelry, artificial flowers, cheese graters, plastic drinking cups, cleaning supplies and other items. The big attraction was that everything was just one Cuban convertible peso, or about $1.11 U.S. 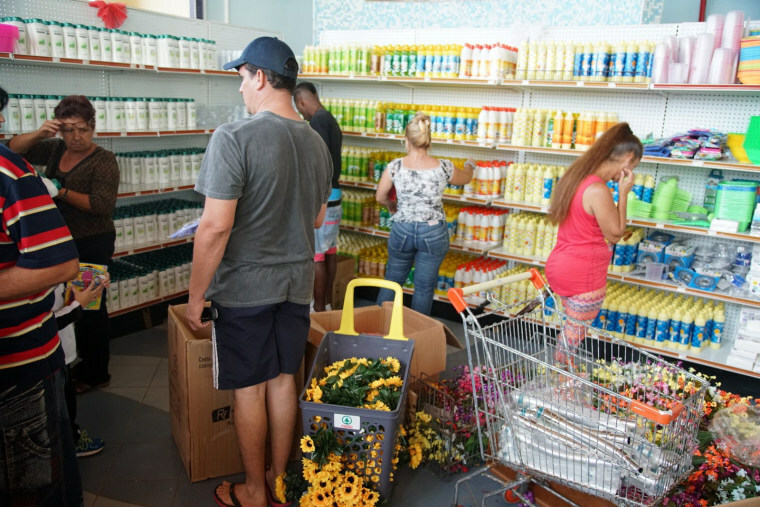 Some stores at La Puntilla offered 10 to 15 percent discounts, but there were no deep price cuts like those seen before Christmas in the U.S.
Not everyone in Cuba celebrates the holiday. “Christmas in Cuba has never been lke Christmas in the United States,” said Marta Rojas, a Cuban author who lives in Havana. Even so, inflatable Santas, artificial trees and other trappings of Christmas began popping up weeks ago in Havana. “Christmas didn’t used to be so popular. It was a thing of capitalism. But things are different now,” said Madan Morell, a vendor who sells chocolate bars, Wrigley’s gum and cookies in Havana’s Vedado neighborhood. An 18-inch Christmas tree stands next to an image of Santa in the corner of her ground-floor apartment. Tracey Eaton traveled to Cuba with support from the non-profit Pulitzer Center.